Bone Marrow Transplant and Stem Cell Transplant: What’s the Difference? Stem Cell Transplant vs. Bone Marrow Transplant: What’s the Difference? A stem cell transplant can be referred to as a bone marrow transplant (BMT) or peripheral blood stem cell transplant (PBSCT) or umbilical cord blood transplantation (UCBT), depending on the source of the cells that are transplanted. In other words, the only real distinction between a bone marrow transplant and a stem cell transplant in the method of collecting the stem cells. Stem cells are versatile cells with the ability to divide and develop into many other kinds of cells. Hematopoietic stem cells produce red blood cells, which deliver oxygen throughout the body; white blood cells, which help ward off infections; and platelets, which allow blood to clot and wounds to heal. Stem cells for transplant can come from the bone marrow or blood. Hematopoietic stem cells are found in the bone marrow—the spongy material inside the bones. 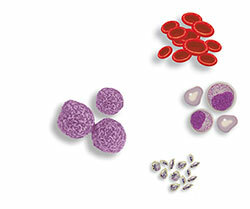 Some of the hematopoietic stem cells circulate from the marrow into the bloodstream. When the cells are found there, they are called peripheral blood stem cells. While chemotherapy and/or radiation therapy are essential treatments for the majority of cancer patients, high doses can severely weaken — and even wipe out — healthy stem cells. That’s where stem cell transplantation comes in. Learn more from the Stem Cell Transplantation Program at Dana-Farber. I have a family member who is suffering from “Stiff Person Syndrome.” We have found out that she can be cured through a Stem Cell Transplant however the procedure is $400,000 U.S dollars. Could you please offer information on other countries that offer the procedure at a lesser cost? I am sorry to hear about your family member’s health troubles. Unfortunately, we cannot offer medical advice on this blog and recommend you speak with your physician about possible treatment and insurance options. You may also want to check out these resources provided by the National Institute of Neurological Disorders and Stroke. I hope this is helpful and wish you all the best. Dear Lee, sorry to hear about your family member. I have a baby son who is suffering from Hurler Syndrome. We did the stem cell transplant in India just few days back in early March. The cost is also so affordable, many times less. You can write to me for any further information. My father had DLBCL lymphoma that relapsed. He has been suggested to go for autologous stem cell transplant. We are so confused between Mumbai (jaslok hospital) or Delhi (Gangaram hospital, Dr Shyam Agarwal). Could you please help me with where you went for the transplant and the name of doctor? Any advice from your experience is greatly appreciated. Read your post regarding successful transplant in India. Now i am in need of stem cells for my father. Can you please help me as to where they can be obtained. Would you please recommend me some organisations or centres that could provide the cells. Thank you. I have a friend who got one done in Chicago for 125,000 US dollars (12 weeks ago). Still very expensive, but much less than what you wrote! My mom has llc cancer (which is where her white blood cells are off the charts)and when her cancer gets bad enough she’ll need a bone marrow transplant in order to live longer. My question is my son was born in a military hospital where they kept his ambilical cord for research . Should I find out how to get to it, if my son was to be a match. I want to prolong my moms life if it could help her. Or would it be wasting hope to further researched. Thank you for your message. I am sorry to hear of your mother’s illness. Cord blood can be an option for stem cell transplant in certain cases; however, stem cells from an adult donor are far superior. There are many variables and it is difficult to provide an answer without knowing more specifics from a patient’s case. Unless the cord blood is stored at a private cord blood bank, it is unlikely that your son’s cord blood is still available, and if it was stored for research purposes, it may not meet the standards for clinical use. My son suffering from Thallassimia major i want to know that which is better Bone marrow transplant or Stem cell transplant. For your information i had stored his sibling stem . Thank you for your message. We’re sorry to hear of your son’s diagnosis. Treatment for every patient is different and we are unable to give medical advice through this blog, so the best approach is to ask your doctor which treatment option is best. Wishing you and your son all the best. If the difference of BMT and PBSCT lies only in the method of collection, why not all HSCT to be conducted in the form of PBSCT? As in PBSCT, the donor can bypass the potential risks of GA for BMT. Hi, I was diagnosed with inflammatory breast cancer which spread to lymph nodes and bone. I read where bone stem/bone marrow transplant can cause Osteosarcoma. I had a bone stem transplant at stage 2 breast cancer in Mexico in February of 2015, my scans at that time showed no signs of bone cancer, then in July of 2015 I had bone scan and it had spread to my sternum and spine. I did radiation for inflammatory breast cancer on my left breast and chest wall and now the cancer has spread to the ribs. I read that side effects of radiation to breast and chest wall can cause it to spread to the ribs. If all this is true did radiation and bone stem transplant cause it to spread so rapidly to my bones? How do I find research to back this? Also, My naturopath Doctor did some testing and says that the cancer started in the bone and not the breast. Can Photo Dynamic Therapy cure bone cancer? What about radio Isotopes? How do you find out where it started? I just don’t know what to believe anymore. We are so sorry to hear about your diagnosis and health issues. Unfortunately, without knowing more information about your medical background, it is difficult for us to answer some of your questions. We also cannot give out specific medical advice on this blog or over email. I hope this information is helpful. Wishing you all the best. What is the cost of bone marrow transplant for 4year of baby. Please visit our webpage about insurance and financial assistance for more information regarding costs: http://www.dana-farber.org/Adult-Care/Treatment-and-Support/Patient-and-Family-Support/Insurance-and-Financial-Assistance.aspx. Posted on the page is also contact information for our Financial Counselors. If you would like to speak with a new patient coordinator in our Jimmy Fund Clinic, please call 888-PEDI-ONC (888-733-4662) or fill out this online form: https://www.dana-farber.org/apps/request-an-appointment.aspx. To learn more about our disease treatment program, please visit http://www.dana-farber.org/Pediatric-Care/Treatment-and-Care-for-Children-with-Cancer.aspx.